Odinani comprises the traditional religious practices and cultural beliefs of the Igbo people.Dibia are the mystic mediators between the human world and the spirit world and act as healers, scribes, teachers, diviners and advisors of people in the community. The name of divination in Igbo derives from ígbá áfà or áhà meaning 'to name' coming from the diviners skill in rooting out problems hence naming them. The dibia or ogba afa, 'interpreter of afa', is considered a master of esoteric knowledge and wisdom and igba afa is a way in which people can find out the cause of such things as misfortunes.Kola nut (ọ́jị̀) offerings and prayers can be performed personally between one and his spirit or in a group in a form of a prayer or chant. The saluter addresses their personal god or chi as well as alusi and their ancestors. 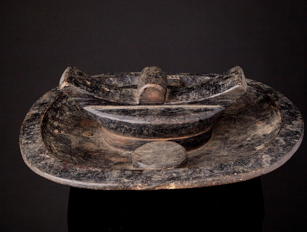 These kola nuts are held in a special round bowl called ọ́kwá with a compartment at the centre of the bowl for condiments for the kola nut such as ground peanuts. 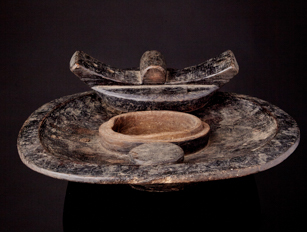 The bowl and kola nut rite is used to welcome visitors into a household. 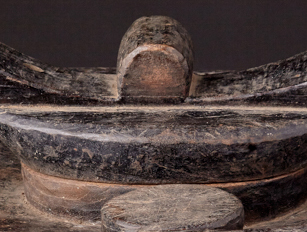 These elaborate kola nut bowls are most common among the eastern Igbo, and point up man's need to surround himself with fine objects in daily and ritual life. 7" x 17.5" x 16"